Get $100 when you Refer a Friend who Buys Carpet! Earn $100 when you Refer a Friend! 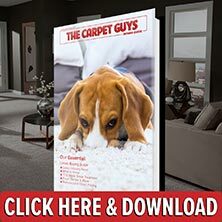 Are you a Carpet Guys customer with friends, family or neighbors looking to purchase carpet or flooring? If you share their names with us and they buy new carpet or flooring, we'll reward you up to $100^ and they'll get $100* OFF their purchase. We appreciate each and every customer who chooses to The Carpet Guys for their flooring needs. To start referring, please fill out the information below and click submit. For more than 10 years, much of our success has come from word of mouth. We appreciate when friends and families recomment The Carpet Guys to one another. If you've just purchased carpet or flooring for your home, welcome to The Carpet Guys family! ^Receive up to $100 for each new household you refer that purchases new carpet or flooring installed by The Carpet Guys. Referral must be made prior to or at the time of the initial in-home estimate. The referred customer cannot live in the same household as the person who referred them and this must be their first purchase with The Carpet Guys. The referral fee will be paid within 60 days after referred household installation is completed and full payment is received. Future opportunities to earn additional bonus offers may be available to those who participate in this program. No limits apply. By providing this information, you guarantee its accuracy and authorize The Carpet Guys to contact your referral and/or you, via the information provided. This offer is subject to change and may be canceled at any time without notice. *Minimum purchase required. Valid only at the initial consultation. Offers not to be combined with any other discounts or special promotions. Cannot be applied to current or past orders. Some restrictions apply. See sales consultant for details.